â€œWe are aware that treasure is something that is very valuable and tourism, for us, is an extremely valuable asset,â€ said Chairman of Tourism Week 2011 Mr. Carl Williams during last Thursdayâ€™s [January 27] tourism press conference at the Ministry of Tourismâ€™s office at Bath Plain. Mr. Williams who also serves as Assistant Secretary in the Ministry of Tourism encouraged residents of Nevis to participate in the scheduled activities that are expected to commence on Friday [February 4] and spread across a nine-day period. 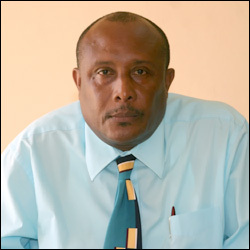 â€œTourism Week 2011 is geared towards increasing the attractiveness of the island as a destination as well as getting greater involvement in the development of the industry and promote the role of the Ministry of Tourism in the overall development of our tourism product,â€ he said. Also present at last weekâ€™s press conference were Tourism Marketing Officer and chairperson of the Miss Teen Hospitality Pageant Ms. Tamica Lawrence, Senior Officer in the Research and Documentation Department at the Ministry of Tourism Ms. Vanessa Webbe and Director of Sales and Marketing at the Nevis Tourism Authority Mr. Devon Liburd. While Ms. Lawrence and Mr. Liburd expounded on two of the major Tourism Week activities: the Miss Teen Hospitality Pageant and the Best Garden Competition respectively, Ms. Webbe encouraged Nevisians to participate in the events and highlighted the importance of involving students. â€œWe always use this opportunity to get children involved and get them to understand and foster an appreciation for the tourism industry through educational awareness. We want our children to contribute the very best to the industry. We know everyone will not work in tourism and we are not asking everyone to work in the tourism industry. We just want our student populace to understand the important role all of us can play in helping to sustain our industry,â€ she explained. Ms. Lawrence also echoed Ms. Webbeâ€™s sentiments as she said â€œeducating students about the role tourism plays in Nevisâ€™ industryâ€ was one of the factors that contributed to the change from the Miss Hospitality Pageant to the Miss Teen Hospitality Pageant. â€œWe found that teenagers are lacking in information when it comes to tourism. We also feel that itâ€™s a very good avenue to take for students especially female teenagers who are interested in hospitality and tourism and itâ€™s a good hands-on experience for students,â€ Ms. Lawrence said as she spoke of the ongoing relationship that the Ministry of Tourism intends to establish with the contestants. â€œOne of the things that we are looking at is to have the various institutions that sponsor the contestants as summer attachments of even Christmas attachments so they can basically go into the field and learn about the hospitality industry and learn about what the organisation has to represent,â€ she added. â€œThe competition is opened to all residents of Nevis; it doesnâ€™t matter where you are from, once you reside and you maintain a home here on Nevis, you are welcomed to sign up and participate. We are going to allow persons, even at the last moment, to register for the garden competition. We do recognise that if youâ€™re entering into a garden competition you just cannot begin a garden today and expect to enter tomorrow, you would have already been maintaining your garden so itâ€™s just a matter of making the decision to enter,â€ Mr. Liburd explained.